Shoe holder comes with heel stopper. Height 6"H. Oval base 7" X 5"; Slant Plate 3" X 9". Color: grey. Shoe holder comes with heel stopper. Height 10"H. Base 7" X 5"; Slant Plate 3" X 9". Color: grey. Shoe holder comes with heel stopper. Height 6"H. Oval base 7" X 5"; Slant Plate 3" X 9". Color: metallic sand. Shoe holder comes with heel stopper. Height 10"H. Base 7" X 5"; Slant Plate 3" X 9". Color: metallic sand. Shoe holder comes with heel stopper. Height 8"H. Color: chrome. Shoe holder comes with heel stopper. Height 10"H. Color: chrome. 8"H display stand for single shoe. Unique custom look created with exposed weld marks of metal. Color: raw steel. 6"H Counter single shoe display holder. Unique tripod curly designed base. Color: creamy pearl. 8"H Counter single shoe display holder. Unique tripod curly designed base. Color: creamy pearl. 6"H Counter single shoe display holder. Unique custom look created with exposed weld marks of metal. Color: raw steel. 8"H Counter single shoe display holder. Unique custom look created with exposed weld marks of metal. Color: raw steel. 66" tall X 48" wide double sided shoe rack with 8 shelves included. Each slant shelf is 12"D X 47.5"L. Color: chrome. 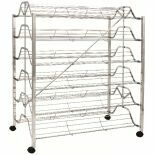 62"H x 44"W x 39"D double sided shoe rack on wheels, comes with 12 shelves included, holds 144-168 shoes. Each slant shelf is 12"D X 42"L. Sign Holder 7"H X 11"L. Color: chrome. 61"tall X 48" wide double sided shoe rack with 12 shelves; rack includes casters. Each slant shelf is 12"D X 47.5"L. Color: chrome. Maple Display Shelving Combo: 32"w Wall Center Unit; 2 Corner Tower Units. Overall Dimensions: 65"High X 62" wide X 15"Deep. Color: maple wood; silver frame. Maple wooden display unit has 5 shelves. Contemporary & functional display combines maple shelves with metal frame. 65"High X 32" wide X 15"Deep. Color: maple wood; silver frame. Maple wooden display unit has 5 quarter round shelves. Contemporary & functional display combines maple shelves with metal frame. 65"High X 21" wide X 15"D Radius shelves. Color: maple wood; silver frame. Slatwall slant display holds a single shoe with heel stop. Display can swivel in any direction. Color: clear acrylic. Attractive oval 12" X 19" dia glass top pedestal. Adjustable in height from 32" to 48" tall (picture shows 3 stands grouped). Designed for displaying handbags, shoes, jewelry, fashion accessories. 12-cube display, easy to install, quick to take apart and transport. Use them at tradeshows or make versatile, economical store displays for shirts, t-shirt, toys, packaged goods, shoes and more. Panels Size: 14"x14". Colors: white, black. 15-cube display, easy to install, quick to take apart and transport. Use them at tradeshows or make versatile, economical store displays for shirts, t-shirt, toys, packaged goods, shoes and more. Panels Size: 14"x14". Colors: white, black. Isle square display table is ideal for folded jeans, clothing, shoes. 47"W x 47"D x 39"H. Ships knockdown ready to assemble. 24"x24" top level; 36"x 36" middle level; 47"x47" lower level. Colors: cherry, maple. Multi-use display round stand 4"H x 12"Dia. Color: bronze. 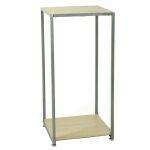 Multi-use display stand 16"Tall x 12"D x 12"W. Color: bronze. Multi-use display round stand 12"H x 12"Dia. Color: bronze. 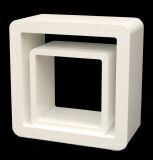 Display holder 16"H x 12"Dia X 3"D sinking bottom. Color: bronze.